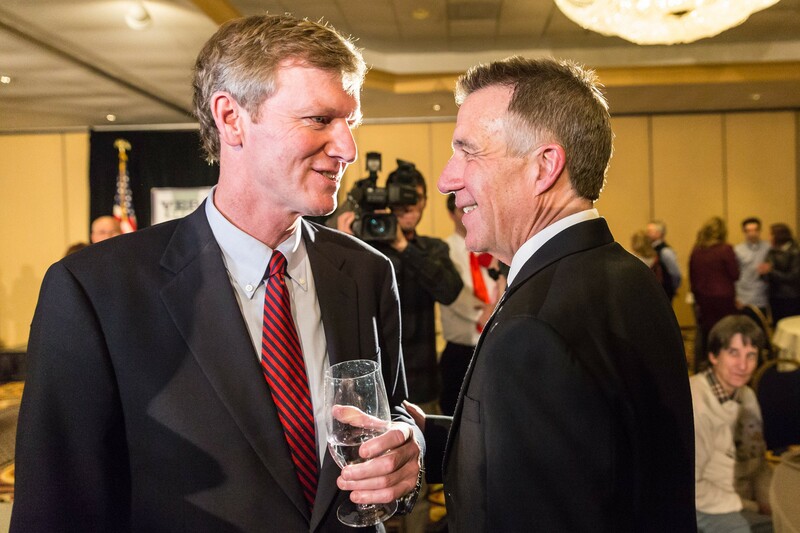 Gubernatorial candidate Scott Milne talks with Phil Scott, right, on election night. Lt. Gov. Phil Scott — the Republicans' sole statewide officeholder — fended off a challenge from a former lawmaker, Progressive Dean Corren. Scott secured 62 percent of the vote to Corren's 36 percent with nearly half of the precincts reporting. In his concession speech, Corren touted the fact that he won Brattleboro by a 2-1 margin over Scott. "I'm proud of what we said and I'm proud of how we said it," Corren told progressive supporters inside Magnolia Bistro. "I wish Phil a highly successful term. But only one term." Scott later started off his victory speech by embracing criticisms lobbed at him during the campaign. Referring to a caller on a radio show, Scott recalled, "He said I was too common, inarticulate, really too simple to run the state. 'Like a farmer,' he said. In answer to those accusations I say, 'Guilty as charged.'" He added, "Because I feel I am one of them, and I am a Vermonter and I am common." In an interview, Corren said it was difficult to unseat the popular Scott when the Republican has not taken a lot of firm positions that could potentially alienate voters. "It's incumbency," Corren said. "And being outspent didn't help. In the last four years, you haven't seen a lot of engagement on the issues by the lieutenant governor. I think we've been trained to not expect the lieutenant governor to contribute to policy and legislation. The problem is most people don't know where he stands on the issues." Corren established himself as a contender when he announced in June that he'd collected enough small donations to qualify for nearly $200,000 in public campaign financing. Scott responded by promptly revving up his fundraising apparatus. With a little help from a few of his Democratic allies, he brought in nearly $290,000. Remembered in the Statehouse for his strong opinions and sharp intellect, Corren said his dedication to single-payer health care compelled him to challenge Scott, who's professed ambivalence on the subject, repeatedly saying he is "waiting to see the details." Scott, who's carved out a reputation as a blue-collar broker of compromises, has ruffled few feathers during four years as lieutenant governor and 10 years in the Senate before that. Corren, who also secured the Democratic nomination, contended that Scott has consistently avoided taking stances on key issues and done little with the role. "We've been ... taught not to expect much," said Corren of the largely ceremonial post. To draw attention to his opponent's alleged shortcomings — not to mention increase his own name recognition — Corren challenged Scott to 10 debates. Scott rebuffed the offer, agreeing to five. Still, it didn't take long to discern the differences between them. In style, temperament and on nearly every issue, the two candidates were a study in contrasts. Corren is a scientist, entrepreneur and inventor; Scott runs a construction company and races cars on top of the part-time lieutenant governor gig. There were some skirmishes. Scott proposed creating an autonomous board to cut education costs, and Corren ridiculed the concept as a "complete state takeover" of education spending decisions. Scott, in turn, criticized Corren for relying on public financing, which he described as taking taxpayers' money without their consent. Corren received endorsements from a number of prominent politicians, including Gov. Peter Shumlin, senators Patrick Leahy (D-Vt.) and Bernie Sanders (I-Vt.), and Congressman Peter Welch (D-Vt.) Seven of the 17 Democratic state senators openly sided with Scott, however.